Uppinangady, Nov 23, 2018: An Indica car parked beside the road at Nekkilady on Feb 12 2017, in the custody of a garage, was found to have a unknown youth’s decomposed corpse. Preliminary report says it appears to be a well planned murder and hence the police are careful to investigate it comprehensively. 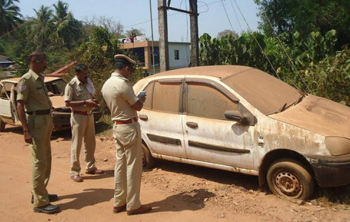 The dead body was found within the car which was parked near a garage belonging to one Sadananda along the NH 75 in Nekkilady. The corpse was assumed to be that of a youth based on the cloths on it. When the car showed signs of blood seeping out of it, the locals decided to investigate and found out the decomposing dead body on a man lying on the driver seat. When the police arrived and started investigating jeans pants, long sleeves clothes with designs and black shoes were found on the corpse. However the dead body was degenerate and recognition impossible. Later primary examination was done on location by forensic experts under the leadership of Dr Mahabaleshwara Shetty and Dr Suraj Shetty of K S Hegde Derlakatte, Mangaluru. For further investigation the corpse was transferred to K S Hegde hospital. The location was visited by Puttur DySP Bhaskar Rai, Puttur rural circle inspector Anil S Kulkarni, Uppinangady SI Ratan abd probationary SI Manjunath and staff who conducted investigation. Post the incident, a case was registered with Uppinangady police station based on garage owner Sadananda’s complaint and the investigation is in progress. A government bus ticket from Ullal to Uppinangady via Panemangaluru was found in the pocket of the dead man. This corpse was found within a car which had been parked since a long time near the garage for repairs. The locals have observed an Indian Cobra frequently resting within the car. Hence, did the man arrive drunk and slept within the car to die? Or did he commit suicide? Or did the snake bite or was he murdered and then disposed off within the car are question by the locals which remain to be answered.